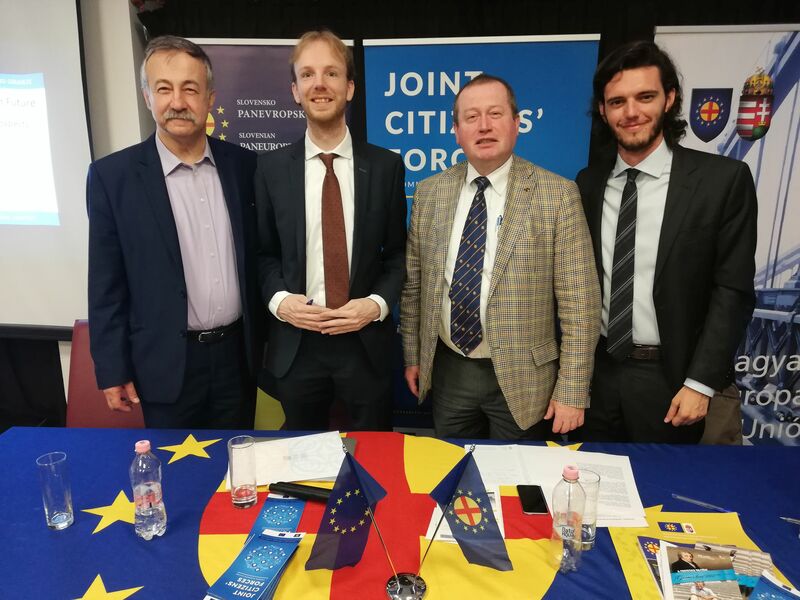 Emanuele Sessa participated to the international conference Euroscepticism – Roots, Challenges and Prospects, which took place in Szentendre – Hungary on 26/27 Oct 2018 and was organised in the frame of the project Joint Citizens’ Forces – Common European Future, of which EMEA is a partner. He was part of the panel focusing on what steps the EU should take to come out of the current, prolonged economic and political crisis. He started his intervention recalling that Southern European countries are both those having suffered the most during the economic crisis and those struggling the most to recover from it, as attested by double-digit unemployment rates in countries like Italy, Spain or Greece. He then argued that it is misleading to talk of migration crisis, because if countries in the EU would have an adequate, common response to the issue – whatever that response may be – there would be no crisis, as the numbers are manageable. The Dublin Regulation is by no means an adequate tool to deal with the issue, all the contrary, it is a source of tension at the very roots of the current political crisis, as it enables Northern European countries better-off in economic terms to send back migrants to Southern European countries that are not in the condition to integrate them. This leads to a situation characterised by opportunistic behaviours undermining trust and solidarity between EU member states. Emanuele then moved on to propose some elements of an exit strategy from the current crisis. The Dublin Regulation should be replaced with a common policy enabling for burden sharing between EU countries based on their socio-economic conditions and related capacity to integrate migrants. That said, “more Europe” will not suffice to prevent future crises related to migratory pressures, as demographic projections show that migration flows from Africa to Europe are bound to increase in the coming decades. In light of this, he concluded that any sustainable solution to the issue would also require “more Eurafrica” and expressed his hope that in the future, EU member states will continue to support the Africa – Europe Alliance for Sustainable Investment and Jobs proposed by the European Commission.